A couple of months ago, we enjoyed a delicious meal with Taste Food (Lynda) and her gracious husband. The Wimpy Vegetarian (Susan) and her husband were also a part of this delightful evening. For dessert, Lynda served a berry crisp that sent my husband over the moon. He compared it to his mother’s fruit crisp, the first I had ever heard of such a thing. A stab of envy went through me, thinking of my own inadequate and unremarkable fruit crisps in the past. There were more mentions of the scrumptious berry crisp during the long drive home to San Diego. By the time we hit LA traffic, I was determined to make a memorable fruit crisp of my own – and soon. Pears were just coming into season, so I decided on them as my fruit of choice and began tweaking my recipe for pear crisp, adding lemon zest and crystallized ginger. I peeled those slippery pears and toasted sliced almonds. 1. Peel, halve and core the pears. Cut them into bite-sized pieces and place in a shallow bowl. 2. Add the lemon zest, lemon juice, vanilla and chopped ginger. Stir to mix. 3. Add the sugar and flour. Mix well and set pears aside. 5. Using a small skillet, lightly toast the almonds over medium-low heat for 2 minutes. Set aside. 6. Using a standing mixer with a paddle attachment, combine the flour, butter, sugar, cinnamon and salt. Mix for 2 minutes on medium-low speed. Using a rubber spatula, stir in the toasted almonds. 7. 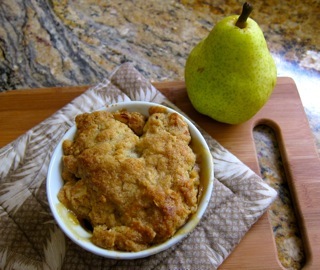 Fill 4 6-ounce ramekins with equal portions of the prepared pears. 8. Use your hands to shape the topping into a ball. Cut the dough into 4 portions. Use your hands to pat out 4 circles to cover each ramekin. 9. Place the filled ramekins on a sheet pan and bake for 45 minutes until the tops are lightly browned and the filling is bubbling. So cute Liz! Sometimes you just can’t win 🙂 This looks lovely, I love ginger and pears together. It has more of a “cobbler” topping, looks yummy! Thanks, Wendy – I can never keep “cobbler” and “crisp” toppings straight. New avatar I see! Liz, This is delicious looking and sounding. I am going out to look for pears. I think I have one around here somewhere! Pears are finally “in” here, as are apples. Men!! Your crisp looks great! I know Larry loved it. He just wants you to keep making more! Well, maybe – he is a clever guy 😉 Hey, congrats on your big win earlier today! Liz, I am hoping to try this soon, but have a question about step number 8–eg, not sure exactly what is meant by “Use your hands to shape the topping into a bowl.”–did you mean ball instead of bowl? Thanks so much! Heavens yes, a “ball”. Thank you SO much for picking that up – my apologies! This look gorgeous, Liz. How fun to live near Lynda and Susan, there must have been some good eats at that table! Lynda made a fabulous meal for 8 of us, well worth the long drive home to San Diego 😉 I’m seeing them both again in 2 weeks – can’t wait! LOL…sounds like the story of my life with my Hubby. He rarely goes over the moon for any food…but I always anxiously wait for his reponse on a new dish. I have to remember that as long as I’m over the moon about the dish, then I shouldn’t be too worried about Hubs. It was great to meet you last Saturday! Such an inspiring day! Well Liz you know what we think of your crisp in our neck of the woods. I have been using apples from our own tree. My neighbor tasted the crisp and I set her up with some of our apples and your recipe! You have been my biggest fan for this recipe – thanks for the support! Thanks, and so lovely to meet you – Marie sent me the blog list, btw. I remember you are busy over the holidays – indeed, see you in January. My pal Rachael of La Fuji Mama will drive down to attend – check out her blog? Oooh, we love crisps of all flavors at our house. I have a similar story with my hubby’s favorite Christmas cookies. I groused to my mother-in-law about it and she said, “Sometimes you just have to say ‘Fine, you can wait until your mother makes that for you’ and move on.” Sound advice. LOL, Kim – thanks – looking forward to seeing you next weekend.